Do you want to give your child everything he needs to succeed as a baseball player? Good! Then don't overlook the most important aspect -- Teach them the basic fundamentals when they are small. Too often a young player's natural athletic abilities will compensate for a lack of fundamental skills. To have success in Baseball, young players must be taught the proper techniques. This paper will deal with the proper teaching methods and drills for throwing, catching (fielding), and hitting. Most of these fundamentals can be learned at an early age. They can also be improved upon if the basic techniques are taught correctly. The basic skills of hand-eye coordination and throwing correctly must be taught and practiced around the age of 5. Proper throwing and a strong arm can be learned. It must, however, begin at a young age. When the child is 5-6 years of age, proper throwing skills can be taught. It is recommended that a plastic ball be used and make sure the child does 3 things: 1) throw with an overhand motion, 2) turn the shoulders perpendicular to the target, 3) step with the proper foot (left foot for right-hander and vice versa). The only way to develop an accurate and strong arm is through repetition. Between the ages of 7-9, games should be incorporated into throwing practice to make it fun and challenging: "longest throw", (after proper warm-up), "hit the target", "count the throws", etc. Use your imagination and create enthusiasm while your child is practicing his throwing. A "soft" baseball should be used for 7 & 8 year olds and a real baseball beginning with age 9. It is also recommended that the balls be smaller in size in order that the young child learn the proper grip: 2 or 3 fingers on top with the thumb directly under the ball. Children between the ages of 10 - 12 should begin practice with the "long toss" drill. Throwing long is the best way to improve and strengthen the throwing arm. After proper warm - up, the thrower should begin backing up and make a few long throws to his partner. It may be necessary to "crow hop." This means the thrower will use his legs by taking an extra "hop" before he throws. See who can throw it the farthest. This drill develops arm strength with an emphasis on the loose arm. No one under the age of 12 - 13 should ever experiment with curveballs, sliders, split fingers, or knuckleballs. These pitches put added pressure and strain on the elbow and are dangerous for the young players. Work on arm strength, accuracy, and the "loose arm" by throwing fastballs. Catching and fielding drills can be taught and practiced simultaneously with throwing. Begin the 5 - 6 year old by catching the plastic ball with 2 hands (no glove). The child will not be ready for a glove until he can catch the plastic ball consistently with 2 hands. Hand - eye coordination can be improved by playing catch with a plastic ball, a basketball, a balloon, or by the child throwing the ball up into the air and catching it with both hands. Ping pong, tennis, badminton, and volleyball are other games which require good hand - eye coordination. Use these games as teaching aids. Don't be afraid to use your imagination and make up games to teach and improve hand - eye coordination or other necessary skills. 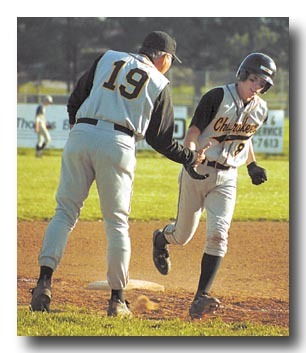 Ground ball technique should begin after the child becomes adept at catching throws with his glove and can physically handle the glove. A smaller glove should be used in order that the child control it as if it were an extension of his hand. Do not allow the child to use the "bigger glove" because the child will become dependent on his glove and will not develop good "soft hands." Proper control of the glove is very important. Begin by rolling ground balls to the child on a hard surface. Have the child field the grounders without a glove and use the "alligator" technique. The alligator technique means that the infielder puts his glove hand on the ground with his throwing hand on top about 12 inches from the glove (like an alligator's mouth). Be sure not to block the eyes as they follow the ball into the glove. This free top hand will offer protection to the child's face in case of a bad hop. Fear is an enemy to all young infielders. Avoid this fear by protecting the face with the throwing hand and protect the private parts with a cup. The feet should be about shoulder width apart and form a triangle with the feet and the glove. Make sure he catches the ball out in front and then bring the ball and both hands to the belly. His eyes should follow the ball to the belly and the coach should be able to see the "bean" on the top of the hat. After many repetitions, the child will be ready to correctly field a groundball (with or without a glove) and use the alligator technique. Wall Ball: The infielder can practice the proper groundball technique by throwing himself groundballs against a wall. Catch the groundball as it caroms off the wall. Work on short hops, back-hands, and fore-hands. Paddle Drill: The infielders should practice catching groundballs using a wooden glove. This requires the infielder to use 2 hands and have "soft" hands (the hands should give as if he's catching an egg). Flyballs can be taught in a similar fashion by starting without a glove. The plastic balls should be caught with 2 hands over the throwing shoulder. A glove may be used only after the child demonstrates the proper technique. The best practice drill is for the child to throw the ball up into the air by himself. Get the child to count these throws to see how many times he can catch it without a miss. The parents or coach can assist the child by throwing flyballs in a way that makes him demonstrate proper techniques. Eventually, the child will be ready to catch some flyballs hit off the fungo bat. Do not hit flyballs with the fungo bat until the child is ready.